The true story of a modern Robinson Crusoe and Huckleberry Finn, a homeless man and his erstwhile companion, a dog named Lizbeth, and their unbelievable, funny and poignant adventures on the road and on the streets. Travels With Lizbeth is a candid and thoughtful chronicle of Lars Eighner's three years of homelessness. The author writes very eloquently and with a sense of humor about his friendships, traveling companions, jobs, and hardships. 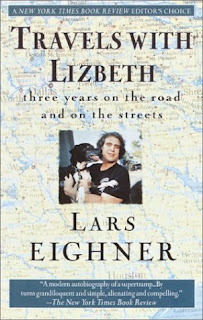 He is a keen observer of people and places and the love he has for his dog, Lizbeth, is heartwarming. Eighner sheds light on the problems that still exist today within the U.S. medical and mental health care systems and debunks common myths about homeless people. He writes without self-pity, yet very humanely about a problem many people would rather forget existed.